Sarah's Cake Stop of St. Louis is seeing double! 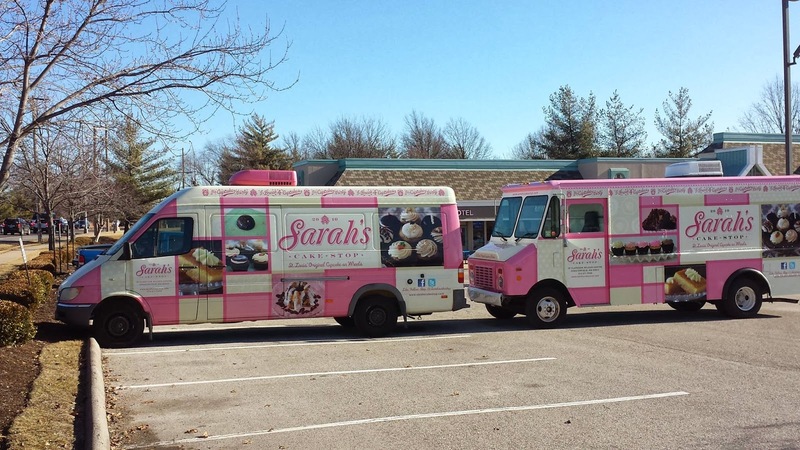 Sarah's Cake Stop of St. Louis has added a second truck to it's sweet route! No longer will hungry sugar mongers have to wait for their stop to show up perhaps once a week to get their fix. Now, Sarah's will have the flexibility to literally be in two places at once! The original van, pictured on the left, debuted in 2010, with quite a different look. With this expansion, Sarah is also rebranding with a new wrap that coordinates the two vehicles. The new one is actually a larger truck, brought all the way from Clarabelle's in Florida, which recently closed due to a saturated market in the area (oh, to have too many cupcake trucks in my area LOL). I'm glad it found a new home. The new truck will simply be called Sarah 2, but is casually referred to as the "Big Sister". The new truck debuts today. Congrats to Sarah's on their expanding family!